When you’re hitting the slopes, the last thing you want to be thinking about is your ski pants. A good pair of ski pants are there for you when you need them the most. Whether you’re just in the backyard building a snowman, or zooming down a black diamond slope, every winter enthusiast needs a good pair of winter pants. Quality ski pants keep you warm, dry and comfortable all day long. With this guide, you’ll be easily able to find the best women’s ski pants for your winter needs. When on the prowl for the perfect pair of ski pants, you should keep in mind a couple of things. There are different types of ski pants that are constructed to perform in various levels of winter climates and weather conditions. Keep in mind what you plan on using your ski pants for, and in what conditions you need to be protected. Insulation, protection, durability and comfort are some of things to consider when searching for the perfect pair of pants. A good pair of ski pants is an investment worth taking time to find, and one that will last you for years to come. With these tips to finding the best pair of ski pants, and our list of the top women’s ski pants on the market right now, staying warm and protected during your next winter vacation will be easy. When thinking about what ski pants are right for you, it’s important to remember that not all pants are constructed equally. Below you will find the three main types of women’s ski pants, and what winter conditions they are best suited for. The three layers in the uninsulated three-layer shell pants are made up of the outer shell, the waterproof layer, and the inner mesh or fleece lining. All of these layers are laminated together, making for an extremely warm and waterproof pair of pants. You don’t have to worry about wearing a lot of layering underneath three layer pants, making getting ready to hit the mountains a breeze. Although these pants can be stiff and reduce your flexibility, the provide ultimate warmth and protection. Three-layer shell pants are perfect for spending all day on the mountain, or for those with jobs that involve long hours in the snow. Two-layer uninsulated pants have the same three layers as the ones mentioned above, but only the outer shell and waterproof layers are sealed together. The fleece or mesh lining hangs free. This serves the purpose of versatility and making it easier to move in the pants. They’re great for having the option to layer clothes underneath in the coldest of winter days, and also take away layers in the warmer winter months. These pants are still as warm as their three-layer counterparts, but provide you with more flexibility and versatility to accommodate a wider range of winter climates and activities. Insulated ski pants are often what we think of when we think of a traditional pair of ski pants. These pants are puffy by nature, and are favored by long journey backpacker and expeditioners. Insulated pants are definitely the best option for keeping you warm and dry during extreme cold and harsh winter conditions. Although they aren’t as flexible and versatile as uninsulated pants, because you cannot remove insulation if the temperature rises. These pants’ insulation is measured in grams, ranging from 20 to 800. If you are prone to getting cold on the mountain, or are planning a long expedition through the back country, insulated pants are the choice for you. The waterproof rating of your ski pants is one of the most important factors to consider when searching for the perfect pair of pants. Most ski pants are rated with a waterproof factor measured in millimeters. This measurement indicates the level at which the fabric filled with water, begins to falter and the water penetrates through it. The higher the rating number, the longer the pants will withstand snow and rain. In order for manufacturers to legally claim that their pants are waterproof, they must have a minimum of a 1,500 millimeter waterproof rating. Ratings can go anywhere from 1,500 mm to 20,000 mm, with the average pant being somewhere between 5,000 mm and 10,000 mm. Ski pants can also be constructed with different types of waterproof fabrics that can lead to different waterproof rating scores. Some popular fabrics that hold up to snow and rain include Gore-Tex, Hyvent and Event. These fabrics are both extremely waterproof while being lightweight and breathable. Another important factor to consider when buying ski pants is breathability. Much like the waterproof rating, there is a breathability rating for ski pants and jackets that measures the fabrics ability to transfer moisture from inside the pants to outside. Breathable pants can help reduce sweat, and keep you from getting overheated on the slopes. A lot of pants include mesh linings and zipper ventilation holes that you can open and close as your body temperature changes. A good pair of ski pants can withstand the abuse and falls of skiing or snowboarding. You want to consider the durability of your ski pants when searching for the perfect pair, so that you can ensure your investment will last you through several winter seasons. Durability is also important when it comes to ski pants, because you don’t want to be stuck on the top of a mountain with a large hole or split seam in your pants. Ski pants have to go through a lot when you’re using them on the slopes, so you want to make sure the pair you buy is up to the task of enduring falls, wear, and general use. In order to have a fun time and ski your best, you need a comfortable pair of ski pants that move with you and fit your body well. Ski pants, just like normal pants, come in a variety of cuts including higher and lower cut pants. The choice between cut comes down to personal preference and style. You want to make sure you try on your pair of ski pants and test them for mobility, fit, and comfort before making the purchase. Different types and brands of ski pants come equipped with different features that are meant to make your life on the mountain easier. 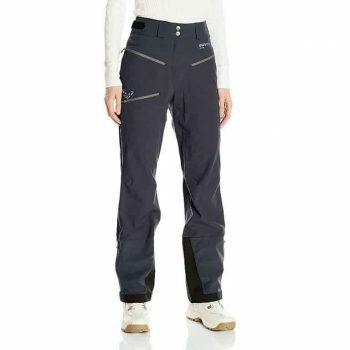 Below are some useful features commonly found on women’s ski pants that you may want to look depending on your ski pant needs. Leg openings are designed differently on every pair of ski pants. Some are constructed to be tucked inside the boot, while others are meant to go over the boot. The most effective way of keeping snow out of your boot is to get pants that are designed to go over the boot. These types of pants have snow cuffs that snap around your ankles to keep snow from getting into your pants. You should test out your pants with your ski boots to see if they’re a good fit before buying them. Scuff guards are extra layers of fabric that are strategically placed on the ski pants to increase durability. The scuff guards are placed inside the ankle of the pant to prevent the bottom of your pants from fraying as they are being rubbed against your ski boots. This feature can help your ski pants last longer. 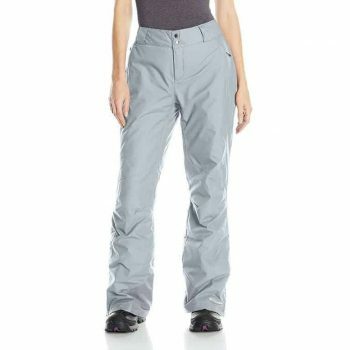 The most comfortable women’s ski pants often come with waist adjustments. These are usually elastic or Velcro cinches or snaps that adjust the width of the waist for the best comfort and fit. Many women’s ski pants are made with bibs and suspenders. These extra features are great for ensuring that your pants don’t fall down or budge when you’re going down the slopes. A lot of suspenders are removable, and many are made of adjustable elastic material. This is a less commonly found feature, but still useful if your pants have it. The jacket to pant link allows you to snap or zip the back of your jacket to the inside of your ski pants avoiding any snow or chilly wind from getting into your clothes. Pockets are by far one of the most useful feature you can find in a ski pants. If you have a pair of pants without pockets, it can be a pain to store things like your money, phone, sunglasses or even a map. There are pockets made specifically for your ski pass so you can easily access it when you need to, and there are general cargo pockets that are big enough to fit everything from snacks to your wallet. 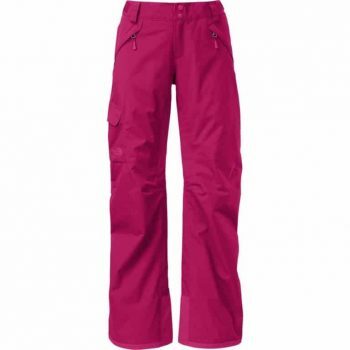 Listed below are the six best women’s ski pants on the market today. They vary in their features, material, and price range, but all are great option. Searching through this list will help you to find the perfect pair of ski pants for you, so you’ll stay warm and dry during your next trip to the slopes. 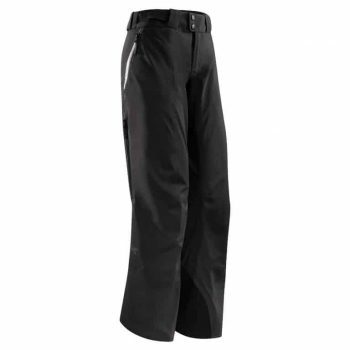 Arc’teryx Stingray Ski Pants are a great option for a waterproof and breathable pant. They are constructed with 100% nylon material with a Gore-Tex light insulation, keeping you warm and dry all day long. These pants have a good amount of insulation, making them perfect for mild winter weather conditions by themselves, or colder conditions with layers underneath. Some useful features that these pants come with include a button-fly closure with an adjustable belt so you can customize the size that’s perfect for you. These pants also have side zips for ventilation, allowing you to cool down and not get overheated. With its Keptortec scuff guards and hip hand pockets, these pants are useful and will last you for years to come. The Helly Hansen Legendary Ski Pants don’t sacrifice quality for fashion. They come in a wide range of bright colors, although their best seller is the classic white pant. You can stay warm and look cute on the slopes with these pants. 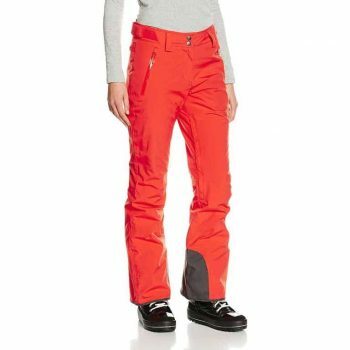 They’re constructed with 100% polyester material, and are made with a 2 way mechanical stretch meaning these pants move with you and give you the ultimate flexibility when skiing. They’re both waterproof and breathable because of their fully seam sealed lining. With two hip pockets and back pockets, there’s plenty of room to store your things on the mountain. These pants are insulated with an impressive 60 g WarmCore PrimaLoft insulation rating, making them ideal for colder climates. The North Face has made a name for itself in the winter clothing business, and these Freedom LRBC Insulated ski pants prove that this company knows what it’s doing when it comes to constructed warm and comfortable ski wear. They’re constructed with a durable and waterproof nylon oxford material, and are insulated with a 60 g heat seeker insulation. Some great features of these North Face pants include articulated knees for mobility, and large cargo pants for securely storing your personal belongings. You won’t have to worry about being cold or wet on the mountain with these durable and high-quality ski pants. Columbia is another well-known name in the winter gear industry. Their Women’s Bugaboo Omni-Heat Pants do not disappoint. They’re constructed with flexible nylon and an omni-heat thermal reflective insulation. These might be the warmest pair of pants on our list. Not only are they guaranteed to keep you warm and dry, Columbia’s Bugaboo Omni-Heat pants come with an adjustable waist, zippered pockets, and lower leg snap too. Dynafit’s Women’s Chugach Windstopper Pant provide the ultimate protection for a variety of harsh winter conditions. They are extremely waterproof and water repellent with a rating of 4.5 m2PA/W. They also boast an incredible wind resistance made possible by their windstopper softshell constructed of 85% Nylon and 15% Elastane membrane. Some great features of the Dynafit pants include a nifty adjustable hem to accommodate women of all height. They come in two stylish colors: asphalt gray and fjord aqua. These are the pants for you if you’re planning on skiing or doing activities in extreme cold, wind, or wet conditions. These pants are the top of the line when it comes to insulation. 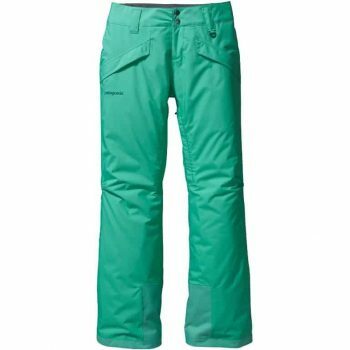 Boasting a 40 g insulation rating and two-layer polyester micro-twill weave, Patagonia’s Snowbelle Pant will keep you warm on any mountain. They feature adjustable elastic tabs, belt loop and webbing loops to ensure that you find the perfect fit for your individual needs. There’s even a powder skirt and gaiters to seal out the snow. Two handwarming pockets are conveniently placed on you hips for you to store your ski pass, hot cocoa packets, handwarmer, or cell phone. With scuff guards to protect your hems, these durable pants will surely be able to keep you warm season after season. Choosing the right pair of ski pants for your individual winter needs is an important and essential part of gearing up for the mountain. Ski pants can be a significant financial investment, which is why you should take the extra time and care when finding the perfect pair for you. Some things to keep in mind when looking for the perfect pair of pants is their durability, waterproof rating, comfort, insulation, and extra features. You also need to consider what kind of conditions and climates you’re going to be skiing in, and what other things you might need your ski pants for. No matter what you’re looking for in a pair of ski pants, there are some out there for everyone. With adjustable hems and waists, it’s not difficult to find a pair that fit your body and give you the flexibility and mobility you need to perform your best on the slopes. Use this guide to help you find your perfect pair of pants to keep you warm and dry all winter long.